Posted in: 2 Shout-out-Looks. Tagged: Bb. Pilipinas 2012, BPCI, Elaine Kay Moll, Janine Tugonon, Katrina Dimaranan, Miss Universe. But back to Elaine, I really adore this girl’s height. And her finely-toned legs add to the more queenly stature that she can project given sharper trainings. I’m not sure if BPCI will field her abroad for one of the less-popular beauty contests, but I am more confident that she will take part in BBP2013. Posted in: 1 Pageant Pages, 2 Shout-out-Looks. Tagged: Miss International 2012, Nicole Schmitz, Okinawa, Scarborough Shoal. The decades of staging Miss International in Japan were not the most memorable, save for the years that the Philippines actually won. The pageant itself was either lackluster or tacky at times. But then again, that is the culture of Japan working in all the nooks and crannies of the beauty congress. And when the hosting duties were transferred to mainland China (with Macau taking charge last 2008), the production was not any better. It slowly descended into one of those dime-a-dozen tilts being invented and staged by the Chinese. So when news about the return of the same to Japan were validated, there were shouts of joy and alleluia everywhere in the country. Aside from our candidate not being politicized because of the ongoing tension between the Philippines and China over Scarborough Shoal, Bb. Pilipinas-International 2012 Nicole Schmitz has fond memories of the Land of the Rising Sun and would love to reunite with its language and culture one more time. What lies ahead of our bet? Bright possibilities, I must say. Aside from Nicole being a near-perfect fit for Miss International, she has this natural spirit of competitiveness that can never go unnoticed. All things being equal, that is. Posted in: 2 Shout-out-Looks. Tagged: Bb. Pilipinas-Tourism 2012, Katrina Dimaranan, Miss Supranational 2012, Miss Tourism Queen International. Call it a healthy spike in inner confidence after winning one of the three Bb. Pilipinas 2012 crowns, but Katrina Dimaranan is glowing nowadays and how! Her oft-unruly hair – albeit long and shiny – has evidently become more compliant as it parts in a more balanced section of her head. The traces of a girly stance (she’s only 18 after all) a couple of months back are almost gone. In its place is a more arresting presence that highlights her exotic Pinay features even more. And the way she glides the runway has clearly improved as well. Her gait is more secure and calculated. Which brings me back to my old question about her scheduled representation abroad – supposedly for Miss Tourism Queen International but not anymore due to franchise kinks. I’m keeping my fingers crossed that she finally gets to be sent to Miss Supranational in Poland as the Official Philippine rep. Otherwise, she would end up being just a wasted beauty. Rizzini Alexis Gomez: a potential MWP in the making? Posted in: 1 Pageant Pages. Tagged: Bb. 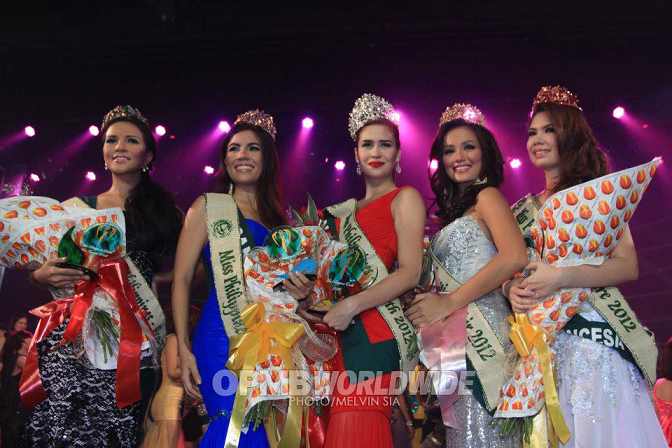 Pilipinas 2012, Maxine Medina, Miss Cebu 2009, Miss World Philippines 2012, Nicolette Henson, Rizzini Alexis Gomez. Rizini Alexis Gomez: could she be the one? Rizzini Alexis Gomez (R) with MWP2011 1st Princess Nicolette Henson during the MWP2012 screenings where the former enlisted. Posted in: 2 Shout-out-Looks. Tagged: Annalie Forbes, AVON, Bb. Pilipinas 2012, Elaine Kay Moll, Janine Tugonon, Katrina Dimaranan, Nicole Schmitz, Philippine Fashion Week, SMX Convention Center. Amidst their tight schedules, the Bb. Pilipinas 2012 winners – Janine, Nicole, Katrina, Elaine and Ali – took time out to grace the AVON Fashion Show held at the SMX Convention Center and coinciding with Philippine Fashion Week.